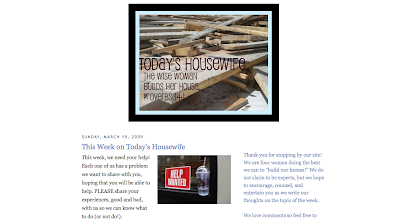 Today we're critiquing Today's Housewife, a blogspot blog that "covers topics important to wives and moms." Blogger Sandra describes the site: "Each week there is a set topic. We post on everything from menu planning to being a good friend. We have four full-time writers who each take a day to post on the subject. On Fridays, we have a guest writer who shares her own opinions and tips on the topic of the week." We list the current topic and up-coming topics on the side-bar. Each Sunday afternoon, we write a post with the topic of the week and the name and site of the person who will be guest posting for us (this post is mainly for the subscribers who don't actually visit the site regularly.) Is the topic of the week clear enough on the site? If not, do you have suggestions to make it clearer? Our readership doesn't comment a lot on the blog. How can we increase interaction with our readers? We've tried to make it clear that we welcome comments and we sometimes end posts with questions, but there still isn't much interaction. We are on Twitter (@TodaysHousewife), and have a fairly good following (430ish). How do we get traffic from the Twitter page to our site? We use Twitter feed for updates. What widgets do you think we could add that would be most beneficial for our readers? Readers: What feedback can you give Sandra and the other writers at Today's Housewife?